When a superheated material begins the transition from one phase to the next (like liquid to gas), small bubbles can form, a process called bubble nucleation. Scientists at Harvard have presented a new method for studying superheated materials in the moments before, during, and after bubble nucleation. This week's Physics Central Podcast is all about comics! And physics! 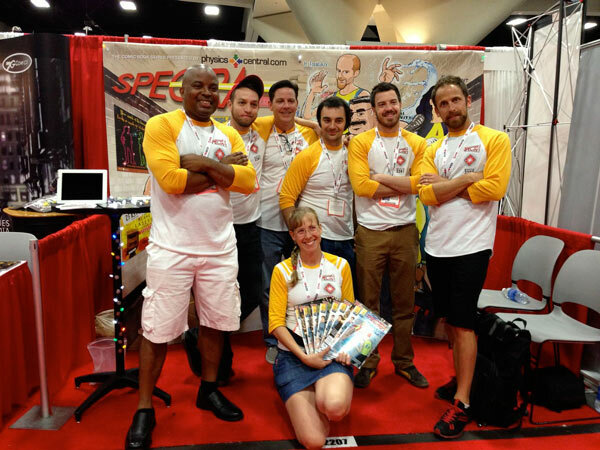 Last week, few members of the Physics Central team headed to San Diego Comic Con 2014 (we saw some awesome science costumes) to give away free physics comics and get people excited about science. But physics and comics aren't such strange partners. This week on the podcast I talk to Simon Oliver, creator of the new comic FBP: Federal Bureau of Physics. In the world of FBP, the laws of physics are breaking down, causing things like gravity to temporarily fail in a high school school parking lot, and a bubble universe to appear in the sky above a city. I also talked to Larry Young, creator of the comic Astronauts in Trouble—a slightly futuristic tale about a the most affluent man in the world claiming ownership of the moon. The comic is largely inspired by Young's love of NASA and space flight. Listen to the podcast to hear more!! This last weekend, the Physics Central team traveled to San Diego to get people excited about physics. 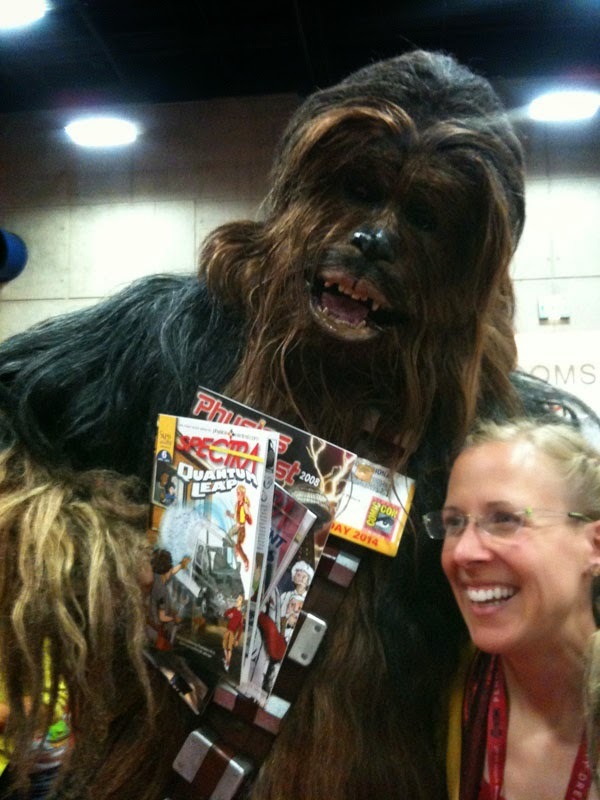 Of course, many Comic Con attendees need no convincing on that front (like Chewie! He loves our comic books!). Science and comics (not to mention science fiction) go hand in hand, mutually influencing and inspiring each other. We saw a bunch of science-themed costumes, and discovered that many of the cosplayers are actually scientists in disguise. Airplanes and birds may have followed similar pattern to increase efficiency. The development of passenger aircraft over the past century mirrors the evolution of flying animals, and shows that evolution is not just a biological phenomenon, according to a paper published today in the Journal of Applied Physics. 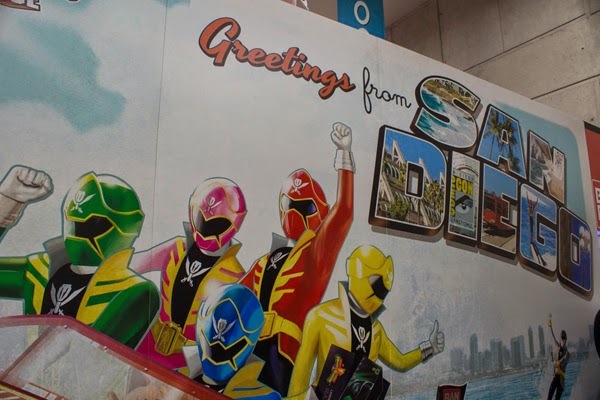 The Physics Central Team has traveled west to the Mecca of all things Nerdy: San Diego Comic Con. Here's this year's team, including this Comic Con first-timer. Clockwise from back left: artist David Ellis, Agent Utah, Hyperspace, Halfstache, Quantum and Spectra herself (aka Rebecca Thompson). Most of the photos in this post are courtesy of the super-equipped Quantum. It's lovely weather here in San Diego, but we're mostly staying inside enjoying the many amazing sights of this awesome gathering. Take a look after the jump. This week on the podcast, Mike Lucibella and I are bringing you some of our favorite physics news stories from July. Some very cool technologies were announced or revealed this month. There's Vantablack, the darkest material ever invented (it absorbs all but .035% of light). It gives the impression of looking down a hole, even when it's wrapped around a 3D surface. There's also the announcement that a private company, LightSail, will test a solar sail technology in 2016. Solar sails use the physical force of photons from the sun to gain speed, the way a regular sail might use the force of wind. Solar sails have appeared in science fiction, but they could be a realistic means of getting around in our solar system without having to pack fuel for the voyage. Scientists at the National Ignition Facility—purportedly the largest laser in the world—used their laser powers to put a bit of diamond under an incredible amount of pressure: 50 million times the Earth's atmospheric pressure (at sea level) and 14 times the pressure at the center of the Earth. Scientists believe that at the core of gas giant planets like Saturn and Jupiter, solid diamond exists under such extreme pressure. This is a very peculiar situation for any material to be in, and by studying it in a lab, scientists hope to understand a bit more about how these planets formed. And finally, a big bit of news for the community of scientists searching for dark matter: this month the National Science Foundation and the Department of Energy announced funding for three new experiments aiming to identify dark matter. Dark matter makes up about a quarter of all the mass and energy in the universe, with regular matter (like stars, galaxies and people) making up only about 1/5 of that. Identifying the type of particle that makes up dark matter would be a major step in understanding how our universe came to be the way it is; so this is actually exciting news for more than just the dark matter scientists. Scientists at the University of Chicago have discovered a new way to create a smooth coating of a sprayed material on a surface. Using a dense suspension of particles, their technique allows for a drop to rapidly form in an even layer on a surface. A side view of a drop impacting a glass surface, splashing, and flattening into a single layer. 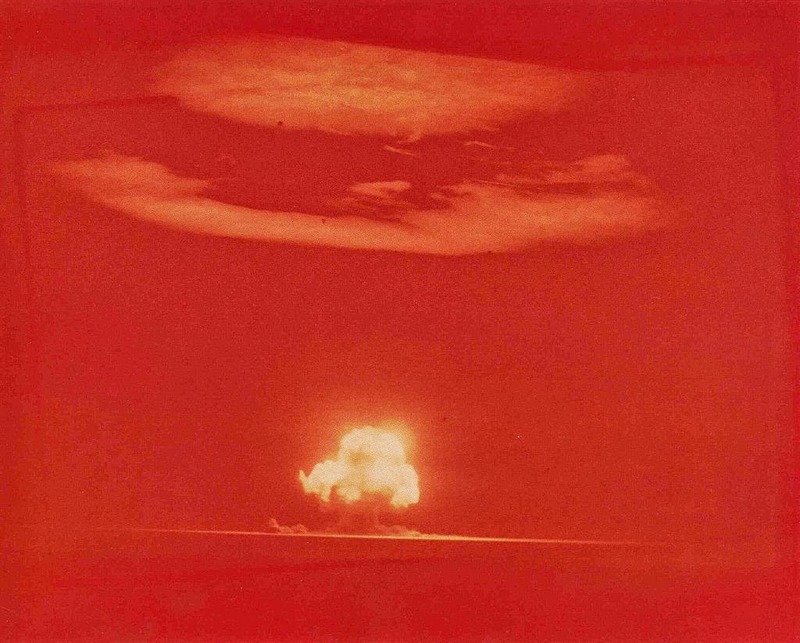 Image Credit: Physical Review Letters. In the past, viscosity and 'wettability' affected spraying a liquid (like paint) onto a smooth surface. Wettability deals with how easily the liquid spreads across a surface: a drop of water behaves differently on a piece of steel than on teflon. A liquid that's too thick doesn't spread easily, either. This new method is less susceptible to these problems. Once again, the Physics Central team will be attending this year's Comic-Con International in San Diego from July 23rd through July 27th. We'll be handing out tons of free laser and Tesla comic books along with extra goodies for Comic-Con attendees. 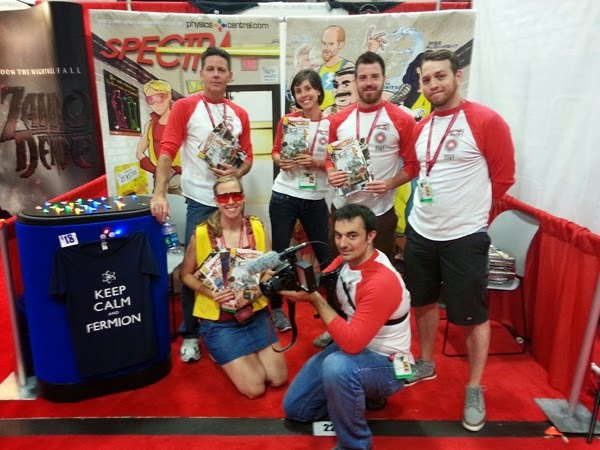 The Physics Central team at last year's Comic-Con. Booth number 2207 in the Exhibit Hall of the San Diego Convention Center. We'll be handing out tons of free Spectra comic books, Tesla comic books, and LED "throwies." 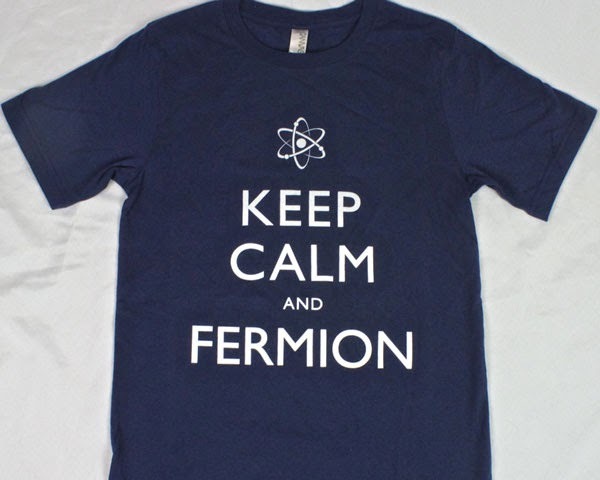 Also, we'll be selling "Keep Calm and Fermion" shirts at the booth. Stop by, learn some physics, and take back some science souvenirs. Our Keep and Calm and Fermion shirt will be for sale at the booth this year. 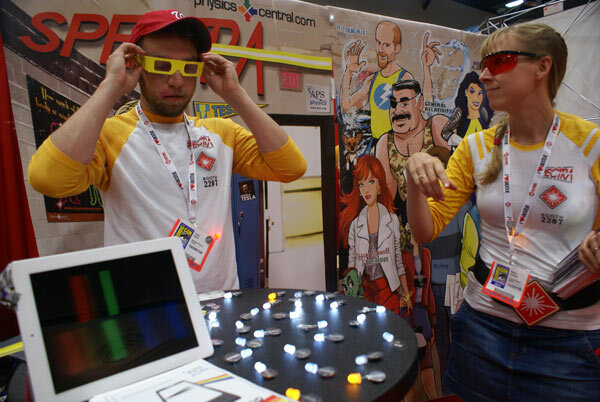 Showing off diffraction glasses LED throwies, and our SpectraSnapp app at last year's Comic-Con. You can check out our blog post from last year to see what we got up to. And if you can't make it to this year's Comic-Con, you can read the comic books online or order hard copies from our online store. My family was big on Sunday morning breakfasts growing up, and pancakes made a frequent appearance. When I was old enough to learn how to make them, my father shared one common piece of advice: wait to flip the pancakes until bubbles start to burst on the top of the batter and hold their shape. I always thought the most interesting part of this instruction was waiting for the shape to hold. That precise moment indicates the pancake is in the state of changing from a liquid to a gel, and bubbles are the best way to tell. That's the mantra many young researchers live by as they compete to establish their early scientific career. But not all publications are treated equally in the world of academia. Some journals are considered more prestigious than others, and some papers are cited much more widely than others — a quantitative measure of a paper's influence. And when there's a way to quantitatively evaluate a group, rankings will inevitably emerge. Each year, Thomson Reuters releases a report on the "World's Most Influential Scientific Minds" primarily based on the number and impact of a researcher's academic publications. While the report focuses on individual researchers, the data also reveal where the highest concentrations of influential researchers work. Several big academic names make an appearance, but there's also a few surprises. For the latest report, Thomson Reuters used data from the past 11 years to compile a list of researchers with the highest number of "hot papers" and "highly cited papers" over that period. A hot paper is defined as having more citations than 99.9 percent of all papers within its field, while "highly-cited papers" have more citations than 99.0 percent of all papers within a field. 3,200 researchers made the cut by having "the greatest number of highly-cited papers in one of 21 broad fields, 2002-2012." The list of researchers is available online at highlycited.com, and you can narrow your search by the researchers' names, institutions (including locations), and fields. 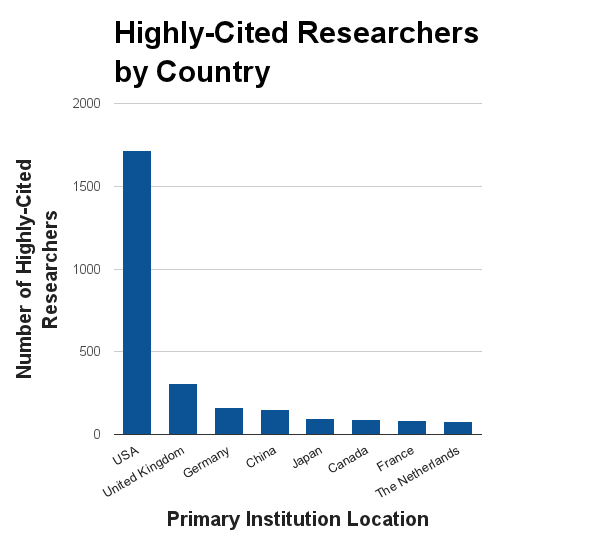 USA reigns supreme with over half of the highly-cited researchers having a primary institution in the country. The United Kingdom came in second with over 300 highly-cited researchers. The graph below charts the rest of the countries based on each researcher's primary institution. Artist's impression of a major impact event. Asteroid and comet impacts could have created refuges for early life on Earth, protecting the first microorganisms from the sun’s harsh rays when the planet still lacked an ozone shield. “Most people associate impacts with the extinction of the dinosaurs, but they can also be beneficial to life,” said Gordon Osinski, a geologist at the University of Western Ontario in London, Canada. This week on the Physics Central Podcast, I talk with physicist Dan Stamper-Kurn about making the smallest measurement of a force ever recorded. He and his group (including lead author Sydney Schreppler) applied a force to a cloud of 1200 atoms, using a laser. Their measurement came out to 40 yoctonewtons: that's 40 x 10-24 newtons (if you drop an apple from a third story window, it hits the ground with about 1 newton of force). The reason this measurement is significant is because it gets to within a factor of 4 of the standard quantum limit, or SQL. This is a natural limit to how precisely scientists can measure certain variables. (The proof for this is in the Heisenberg Uncertainty Principle). The limit arises through various means, but scientists reach it when the system itself has an uncertainty greater than the measurement. In many cases, the observer imposes this limit: for example, if a scientist uses photons to study a single atom, the photons may start to influence the motion of the atom. So at some point the scientist can't discern the natural motion of the atom from the motion imposed on it by the photons. Reaching this limit is important for many experiments, including LIGO, the Laser Interferometer Gravitational Wave Observatory. LIGO is searching for ripples in space time, known as gravitational waves. When a gravitational wave passes by, it may stretch or contract space itself. A distance of 1 meter may suddenly be shorter by something like 10-21 meters. LIGO scientists want to measure these changes, but they are bumping up against the standard quantum limit. Nergis Mavalvala also chats on the podcast about how experiments like the one by the Stamper-Kurn group will help LIGO anticipate challenges that may arise as they approach the standard quantum limit. Last week I took an Amtrak train south for the holiday weekend, and there was a delay. The explanation: the track was under a 'heat advisory' and the train had to travel at a slower speed. This left me wondering what happened to the tracks when it got so hot outside - and why they couldn't travel at speed. An Amtrak passenger train. Image Credit: modified from Massachusetts Office of Transportation on Flickr. Most railroad tracks are metal and when (most) metal heats, it expands. 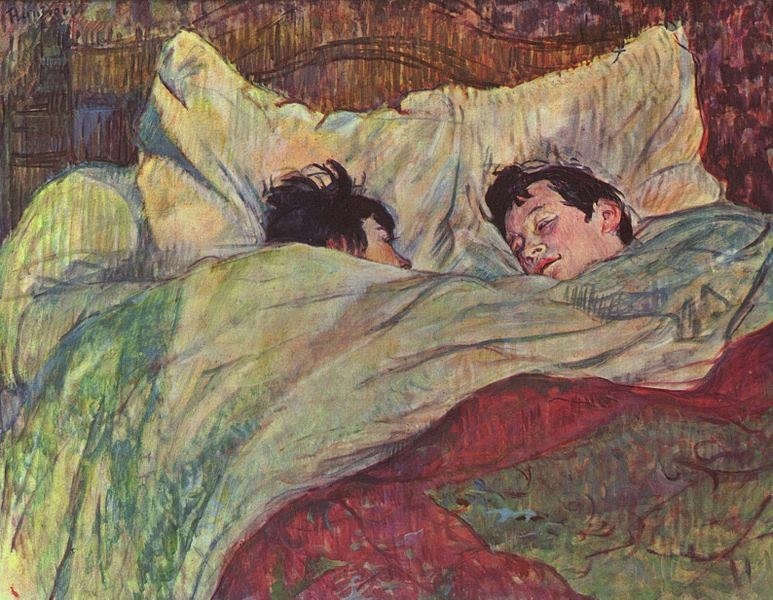 As the temperature rises, the molecules in the metal vibrate more, and they need more 'space,' so the volume increases. Different materials expand at different rates when they're heated. That's why if you have a glass jar with a lid you can't open, you can run it under hot water. The lid will expand more than the glass - allowing you to easily open the container. There's been a lot of buzz lately about a therapeutic and augmentative procedure called tDCS, with promising results. 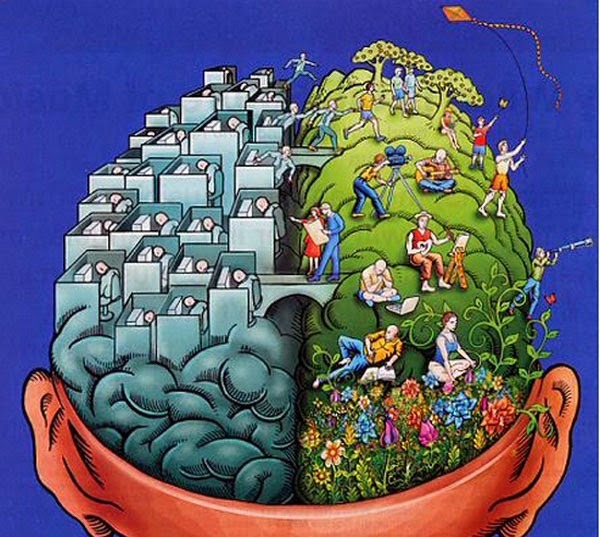 tDCS may not only aid in the treatment of conditions such as depression and anxiety, but it also may be a quick, non-invasive way to improve focus, learn skills faster, and remember facts more easily while studying. If you're wondering why you haven't heard of this miracle technology yet, it's because of what tDCS stands for: Trans-cranial Direct Current Stimulation. In layman terms, that's "putting electrodes on your head in hopes of shocking yourself smarter". At first blush, maybe it doesn't sound so appealing, but bear with me. Some salon manicures require you to dry your freshly painted nails under a UV light. But why only certain types of manicures and why UV? Why don't you always dry your nails with a UV light? And when you do paint your nails at home, why does cooling wet nails help them dry faster? Nail polish fundamentally consists of four things: solvents, polymers, pigment, and plasticizers. The plasticizers increase the flexibility of the polish, and pigment adds color. The polymers strengthen the polish, make it easy to spread, and help it stick to the nail. The solvents keep everything mixed together until they evaporate, leaving behind a smooth nail polish.